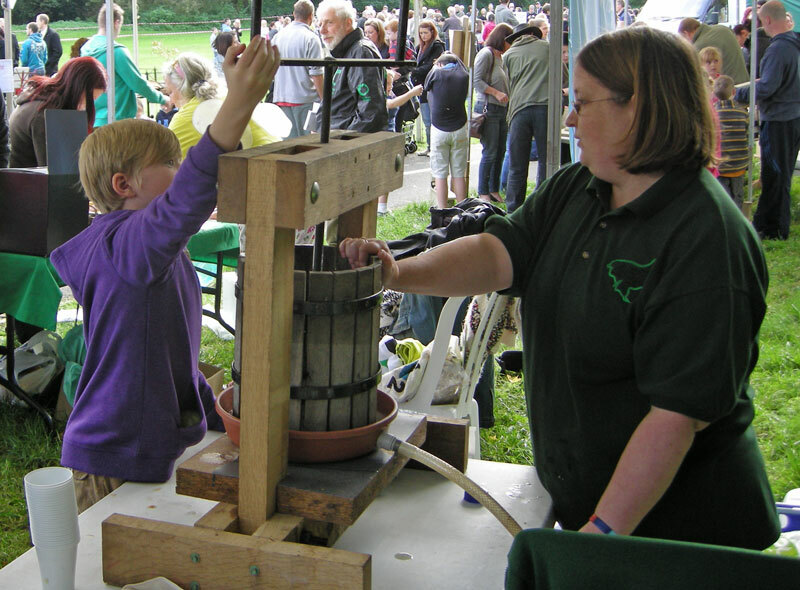 Since then Green Day has been held every year (except when rained off in 2010) with an ever expanding range of activities, most which are hands-on, for both adults and children, and mostly green/environmental. The 2012 event, was held on 7th October and was a brilliant afternoon out and, unlike many such events, almost all the activities for children were free, with small charges for donkey rides & face painting. Attractions included Paul Hand, ‘The Animal Man’ with a fascinating (read scary) collection of small beasts including hissing cockroaches and a tarantula along with baby rabbits for the children to stroke and a couple of meerkats. Twice during the afternoon there were birds of prey demonstrations with one brave little lad putting on a huge glove for an owl to land on. Children were making bread ‘hedgehogs’ at the Cooking Bus, having their faces painted, riding donkeys, scaling the climbing wall, doing craft activities, building their own bird boxes (small charge), making apple juice and having a whale of a time with some serious tools in a miniature house. The activities were not just for children either – anyone who stood still long enough was likely to get roped in as a volunteer by the Wyldwood demonstrators to make a strong rope out of loose grass or light a fire without matches, be instructed by Trevor on how to make better compost, or get their BMI and blood pressure measured with some kindly advice on how to stop killing themselves! Dozens of local organisations were represented including Shropshire Wildlife Trust, Unit TEN Horsehay (training disabled people, making traditional rustic garden furniture and craft items), Green Gym, Boys Brigade and a spirited performance from the newly formed Telford Jubilee Band who recently walked up the Wrekin and performed at the top to raise money for instruments. Chelmarsh Owl Sanctuary were there with birds the children could stroke, as were Friends of the Earth, STROWP (South Telford Rights of Way Project), the traditional hog roast and tea and coffee stalls along with many others. Not your typical ‘wander round, look at stalls and spend money’ day out at all but really informative and fun, I couldn’t fault it– well done Madeley Parish Council! Click on the photo to see more pics.